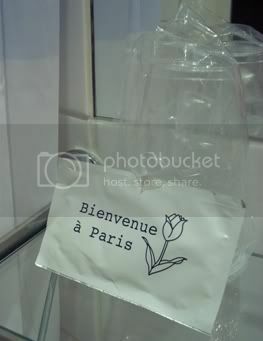 I speak French fluently. I started learning it in 1998, I went to college and grad school to study it, and now I teach it at a university (my absolute dream job). Besides teaching, language is my passion. I'm oddly in love with grammar rules, with tenses and moods, with verb conjugations and parts of speech. And on top of it all, spoken French sounds so beautiful! The chapters in my students' textbooks are themed - some are holidays and traditions, some are weather, some are the human body. Without question, though, every student loves the food chapter. I think it might be because some students like sports and others like fine arts, but everyone eats. It's the one chapter that every student is guaranteed to have background knowledge on. La femme donne à manger au chien. La femme nourrit ses enfants. In the first sentence ("The woman feeds the dog"), the direct object is le chien, the dog. The verb here is donner à manger - literally, "to give to eat." In the second sentence, however, the direct object changes, and therefore so does the verb. The second sentence means "The woman feeds her children," and the verb, nourrir, has the same origin as our English verb "to nourish." It's a lovely thought, isn't it? I've been keeping this in mind lately when I grocery shop or while I prepare meals. Am I simply giving myself something to eat? 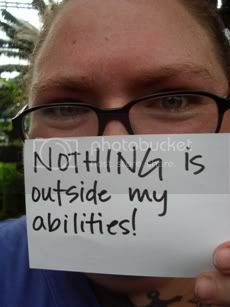 Or am I truly nourishing myself? I have decided on a dozen short-term goals in between my starting weight and long-term goal weight - I am hoping it helps me keep on task. In the past, I've always felt so overwhelmed by the "bigger picture" of how much weight I have to lose, that I lost sight of my progress and successes. Now, I'm taking it 25 pounds or less at a time. And as of last Friday, I met my first weight loss goal. 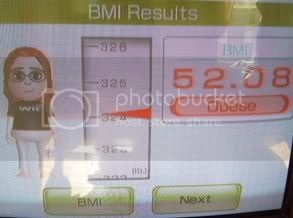 My first mini goal was to lose enough weight to finally use the Wii Fit that my parents got me for Christmas. My sister had used it when we first got it, but when I tried, it told me I weighed too much. I was heartbroken, and we folded up the balance board and never opened it again. On Saturday, after my walk at the park, I unpacked the balance board, put the game in the console, and got on again. 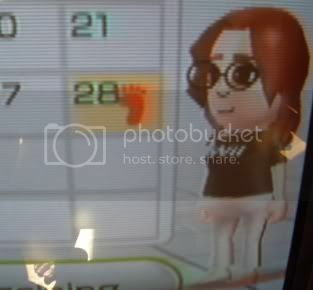 I was worried that my weight may have fluctuated back up for whatever reason, but as I got on to register my Mii, it not only worked, but showed my weight as even lower than at my weigh in! Hooray! I did a hula hoop activity quite a few times - super fun! And I liked the step activity where you step on and off and to the side of the balance board. I'm still very weak at the weight training activities - but that will improve, I'm sure. I know the Wii Fit is not the cure all for my exercise problems - I'm still going to keep walking, and I'm going to go to the gym once I get my first paycheck. But this is a good thing to have for rainy days, or when I have excess energy and I want to get it out somehow. Mainly, though, I'd like to use it for yoga in the morning before work. I think it would help me with my balance and it would be a great start to my day. Yoga is something I've always been really interested in but I didn't think I could do most of it because my body's range of motion was so limited. But I've been doing some of the things on the Wii, and there are a lot of poses that I can do even now! The city motto for Chicago is urbs in hortis ("city in a garden") and the motto for the Chicago Park District is hortus in urbe ("garden in a city"). On Saturday, I went to one of my absolute favorite places in Chicago: Garfield Park Conservatory. It's not very far - three stops on one El train, then three on another - and there are amazing things to see there, no matter what time of year it is. I try and go fairly often to see how things look in different seasons, and also to just relax and enjoy such a beautiful place. I went there, for example, the day after I finished all my annotated bibliographies for my Masters exams - after catching up on sleep, of course! 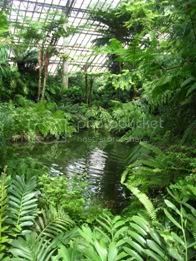 There are several different rooms inside the conservatory with different themes - a rainforest, a desert, and more. 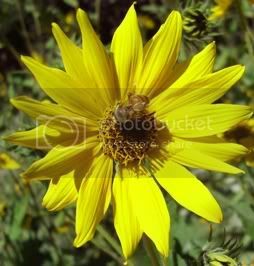 There are rooms dedicated to specific kinds of plants, like aroids and fruit-bearing plants. There's one room with a great big koi pond, complete with beautiful fish and Chihuly blown-glass lily pads. There's even a room for little kids with stuff they can touch and climb on! The best, though, are the outdoor gardens. 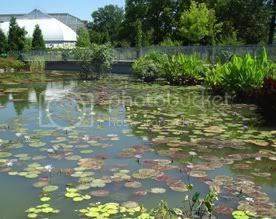 There is a big lawn for picnics, a walking path, a pond with lily pads and a small fountain, and even beehives! Beekeeping is legal in the city of Chicago, so they have several hives and they sell their own honey in their gift shop! 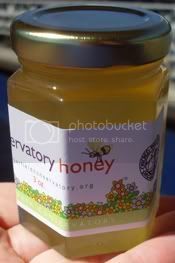 The park and conservatory are free admission, so whenever I go, I pick up a jar of their honey to help support them. It's a great cause, and I think the honey even tastes better because I've seen where it comes from! I think my favorite thing at the Conservatory, though, is the Labyrinth. I just discovered it for the first time in April with my sister, and it was ... miraculous. 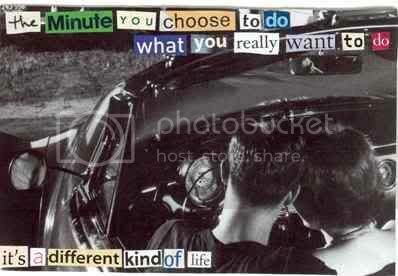 It was life-changing, and I know that probably sounds silly, but it's true. I had the most amazing experience while walking it. Pause to clear and quiet your mind. Steady your breathing. Step into the labyrinth. Shed thoughts and emotions. Quiet and empty your mind. 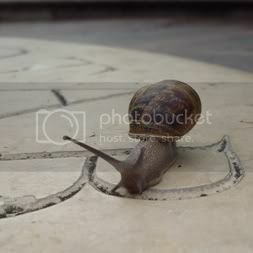 Begin walking, taking plenty of time. When you reach the labyrinth center, pause and relax. Return by the same path, ending where you started. The return moves you into union with the divine, with insight or with healing forces. I handed Katie my purse, then headed in. I tried to clear my mind as best I could, but there were so many worries running around in there. My Masters exams were coming up - was I prepared enough? What if I failed? Or - what if I passed? What's going to happen next in my life? Will I find a job? Will I have to leave Chicago? And as I walked, I wondered if I was doing it right. It seemed to be taking me a long time to reach the center, and there were so many loops and curves. When I finally got to the end of the labyrinth, I "figured it out," so to speak. Unlike a maze, there are no false turns or dead ends in a labyrinth. There is one true, correct path, and you are on it. Don't worry about the journey, just trust that you will end up exactly where you need to be. 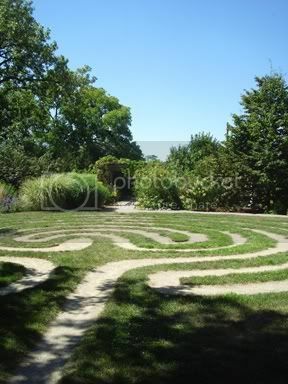 As I retraced my path out of the labyrinth, I felt incredibly hopeful about life. And Saturday, as I walked through the gardens, I remembered that pure, enlightening moment and how it applies to my new lifestyle. All these times when I thought I had failed - those weren't false turns. 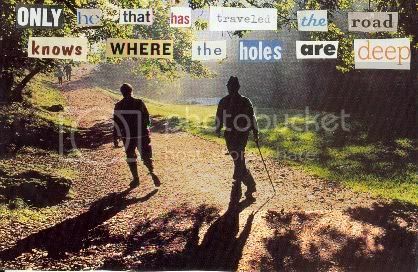 They were necessary moments on my path - the one, true path - towards where I need to be. I learned from them, and I carry on towards my goal. And I feel so hopeful again. I'm working on eating better and eating less by trying to develop new ideas about food and how to nourish my body. Part of my new eating philosophy is trying to eat not on a schedule, but when I feel hungry. The main purpose for this is to curb mindless eating, eating when I am bored instead of when my body actually needs to be fed. Getting back to work definitely helps, since I'm pretty busy these days. I've set a personal goal for myself to be on-campus from 9-5 every weekday. I don't teach on Mondays, so I have eight hours that day to get work done. The other four days I have three hours of teaching and five hours for grading, lesson planning, and administrative miscellany (of which there is quite a bit, especially in the first few weeks!). I get to my office building a little before 9 and go to the café on the ground floor for my daily special: a big cup of ice. Twenty-two cents, and the ice lasts through the first two refills of water. I sit at my desk, check my e-mail, and have a cup of yogurt. 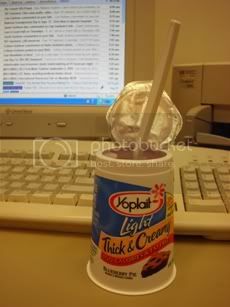 I'm totally in love with Yoplait Thick and Creamy light yogurts. I love fruit but I'm kind of picky about fruit-in-yogurt. It's a consistency thing. Peaches and apples good, blueberries and strawberries bad, etc. But I love blueberries and strawberries! So the Thick and Creamy yogurts are great. My favorites are blueberry pie, cherry cobbler, and cinnamon roll. Their regular (non-thick) light yogurts are good too - I like apricot mango, apple turnover, and banana cream pie. I teach one class in the morning, then come back to my office for an hour before teaching two more classes in the afternoon. I use this hour for lunch - usually a small container of leftovers or a Weight Watchers frozen meal, and more water. I don't have a microwave at home, but we have one at work, so I take advantage of only having to wait three or so minutes for my lunch - in the oven, it's like half an hour for some of them! After my afternoon classes, I have two hours to work on whatever I need to get done before the next day. I keep sipping at some water, but I usually feel hungry around 3:30 or 4, so I make sure I have some smart snacks on hand. 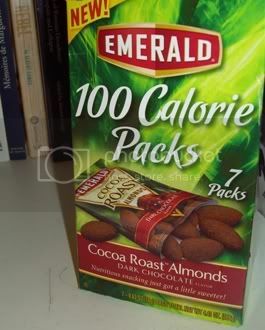 My recent favorite are these cocoa roasted almonds from Emerald. They satisfy so many needs - crunchy, sweet, chocolatey - and best of all, they're pretty filling for a 100 calorie pack! They kind of taste like chocolate Teddy Grahams, which is pretty amazing, I think. It's just what I need to get me through the afternoon! It's the second week of Drop Dead Gorgeous by December, and I'm loving it so far. I've met so many new bloggers and found so much inspiration in their journeys. I'm also loving how positive I feel about my journey - I'm only a few weeks in, but I've already come so far and done so much good for my body and my life! Progress on my DDGbG goals: So far, so good! This week's new recipe was fueled by Sarah having an abundance of zucchini at her place. I Google searched "zucchini recipes -bread" to try to only get savory recipes, and I came across a great one from Diabetes Daily: zucchini-crust pizza. 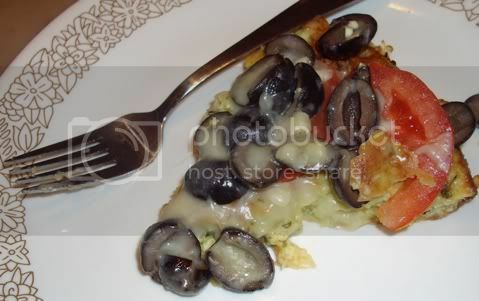 It's essentially a frittata that you put pizza toppings on, and it was great. We used an 8" pan instead of a 10" so the bottom was a little thicker than the picture on the website, but it was still super delicious. We didn't use pizza sauce, just sliced fresh plum tomatoes, sliced black olives, minced garlic, and about a cup of mozzarella cheese. Amazing! Preheat oven to 400º F. Drizzle a little olive oil in a 10" pie pan and coat lightly with flour. Combine the zucchini, eggs, flour, mozzarella, parmesan, basil, and 1 tablespoon olive oil in a bowl and mix well. Spread into the pie pan and bake for 35 to 40 minutes or until golden brown. About halfway through the baking, brush with the remaining olive oil. Remove from oven. When it has cooled for about 10 minutes, use a spatula to loosen the crust from the pan so it won't break later. Top with your favorite pizza items and bake at 400º F until heated through. It makes four servings, but I think we cut it up into six - so I had some for dinner and then brought another piece to work the next day for lunch. It was easy, delicious, and inexpensive - definitely a recipe I'll hold on to! ONE thing that you are proud of for the week: Surviving my first week of full-time work! I've taught before, but there are all new challenges this year as a lecturer compared to when I was a TA in grad school. I've set a personal goal to stay on campus from 9 to 5 every day, and to not bring any work home. I made it through a week of this, and I really love the feeling of coming home and not worrying about work! ONE thing that you can improve upon for the following week: Walking more. Now that I'm back to work, it's so easy to come home and think "Dinner. Relax. Bed." Walking doesn't take much time and I always feel so great during/after it. Plus, I need to enjoy the nice weather here in Chicago while it lasts!